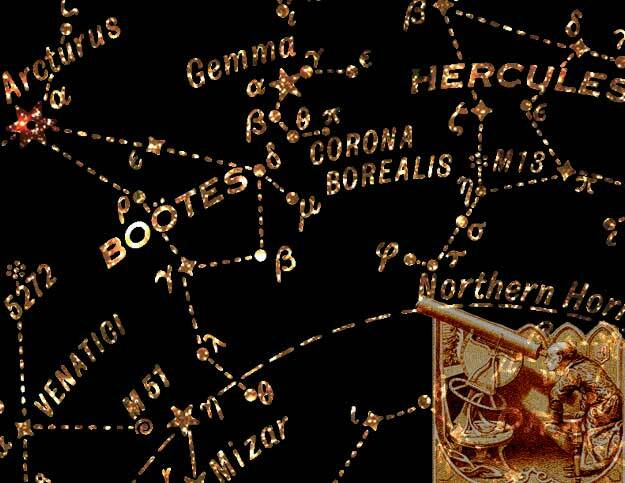 Boötes ~ "The One Who Is Coming"
The star Arcturus and the constellation Boötes are referred to more or less interchangeably. Boötes is generally considered to be a Herdsman (as in French: Le Bouvier), for he eternally shepherds the stars around the North Pole. The constellation Boötes contains the fourth brightest star in our entire sky, Arcturus, a red giant about 24 times larger than the Sun with a luminosity 115 times our sun, lying 36 light years away from the earth. 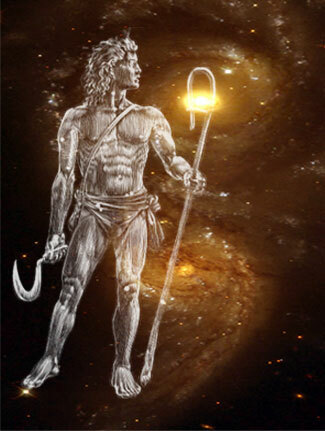 Arcturus is known esoterically as the herder of the Divine Will emanating from the seven stars of the Big Dipper and acts as a bridge between these and Virgo the Virgin, nourisher of the Christ consciousness within the form. If we look to the heavens and study the evolution of the universe over millions of years, we see that galaxies, solar systems and stars interact with each other for varied periods of time. When in close proximity these large systems share magnetic currents, attractive and replusive, containing physical matter and influencing the evolution of that planet, star or galaxy. Though they are "passing in the night," a star can impregnate a planet with an element which could be the seed needed to catalyze a new life form in which sentient consciousness will exist. Presently Arcturus points or "spikes" to the star Spica (located at 23 degrees of the sign Libra) in the knee of the constellation Virgo. Arcturus, known by ancients as the Guardian of the Bear, appears to be "herding" the star Al Kaid, pointing the way over centuries towards the arms of the Virgin, Virgo. It's because of Boötes position behind the Bear's tail that the constellation is closely linked with the Great Bear. Esoterically we know the Great Bear embodies and emanates the quality of Will to our solar system. Could it be that Arcturus is an Avatar blending its consciousness with the Will and herding it, causing great evolutionary change to all in its path? The ancient records and myths of Boötes (Arcturus) give clues to this celestial event. An Avatar can be defined as one who is the physical embodiment of a quality of consciousness which permeates a space over time, leaving its essence to change that region forever. Hinduism and other religions have defined Avatars as deity taking human physical forms on this earth. Filled with Divine Will, Arcturus, as the bridge between the seven main stars of the Great Bear and Virgo the Virgin, stimulates great evolutionary changes to all in its influence. Close by Virgo is then the Holy Grail that receives the Will of God. The origin of the name Boötes is not certain ~ the Greeks knew this constellation as Arctophylax or Bear Watcher, Bear Keeper or Guard. It probably comes from a Greek word meaning "noisy" or "clamorous," referring to the herdsmans shouts to his animals: the Hunter in pursuit of the Bear. Another explanation is that the name comes from ancient Greece and means "ox driver," from the fact that Ursa Major was sometimes visualized as a cart pulled by oxen, "The Wagoneer or Driver of the Wain ~ Boötes with the Wain the North unfolds." According to a story that goes back to Eratosthenes, the constellation represents Arcas, son of the god Zeus and Callisto, daughter of King Lycaon of Arcadia. One day Zeus came to dine with his father-in-law Lycaon, an unusual thing for a god to do. To test whether his guest really was the great Zeus, Lycaon cut up Arcas and served him as part of a mixed grill. Zeus easily reconized the flesh of his son. In a burning rage he tipped over the table, scattering the feast and killing the sons of Lycaon with a thunderbolt, as he turned Lycaon into a wolf. Then Zeus collected the parts of Arcas, made them whole again and gave his son to Maia the Pleiad to bring up. Meanwhile Callisto had been turned into a bear, some say by Zeuss wife Hera out of jealousy, or some by Zeus himself to disguise his paramour from Heras revenge, or even by Artemis to punish Callisto for losing her virginity. When Arcas had grown into a strapping teenager he came across this bear while hunting in the woods. Callisto recognized her son, but though she tried to greet him warmly she could only growl. Not surprisingly, Arcas failed to interpret this expression of motherly love and began to chase the bear. With Arcas in hot pursuit, Callisto fled into the temple of Zeus, a forbidden place where trespassers where punished by death. Zeus snatched up Arcas and his mother and placed them in the sky as the constellations of the Bear and the Bear Keeper. The Greek poet Aratus visualized Boötes as a man driving the bear around the pole. Later astronomers have given Boötes two dogs, in the form of the neighboring constellation Canes Venatici. A second legend identifies Boötes with Icarius (not to be confused with Icarus, son of Daedalus). According to this tale, the god Dionysus taught Icarius how to cultivate vines and make wine. When he offered some of his new vintage to the shepherds, they became so intoxicated that their friends thought they had been poisoned, and in revenge they killed Icarius. His dog Maera fled home howling and led Icariuss daughter Erigone to where his body lay beneath a tree. In despair, Erigone hanged herself from the tree; even the dog died, either of grief or by drowning itself. 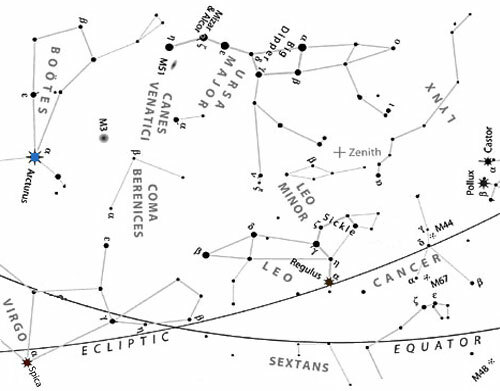 Zeus put Icarius into the sky as Boötes, his daughter Erigone became the constellation Virgo, and the dog became Canis Minor or Canis Major, according to different authorities. All year round you can see Arcturus by following the curving line of the handle in the Great Bear, extended 30 degrees. An old tradition has it that one can "Arc to Arcturus" from the Great Bear to locate the star. Five of the seven stars in the Big Dipper are moving through the sky in the same direction; the stars Dubhe and Al Kaid are moving in the opposite direction. The contrary motion of these stars will eventually cause the Big Dipper to change shape. by Ian Ridpath, Universe Books, New York, 1988.
published by Gourmet Guides, San Francisco, 1982.